Cajun Stitchery is now on Flickr.com. I am starting to load pictures of embroidery on there. There are only a few now but should be more as time goes by. It is at www.flickr.com/photos/cajunstitchery. Headboard embroidery has been finished and delivered. The headboard made me realize that we need a new tablecloth but this one is going to be covered in embroidery. Our kitchen table, made by George, is octagonal. The last tablecloth that I made for my kitchen table was at the direction of my mother. She did not want the ends of the tablecloth to drape. She wanted me to put elastic on the ends of the tablecloth so we wouldn’t accidentally pull on the tablecloth and knock things over. Well, she had a good point and I made it as she instructed. Alas, it is now old and worn. The kitchen curtains were made earlier than the tablecloth. They were my first attempt at roman shades and turned out very nice. Of course, everything, curtains, tablecloth, and even the napkins were from the same fabric. I’m just ready for new décor throughout the house. This will be a good start. The tablecloth fabric is natural colored muslin. Muslin used to be the cheapest fabric out there and was used to make mock ups of patterns. Now muslin is apparently one of the “in” fabrics because it is certainly no longer the cheap fabric it used to be. Designing the embroidery to go on the tablecloth has been time consuming. We have so many stock designs that it is hard to choose. I finally decided to use several of the designs in my favorite color – red. I needed some sort of a design plan. It turned out that one of my digitizing programs is able to do this to scale. Now that’s a very nice feature. 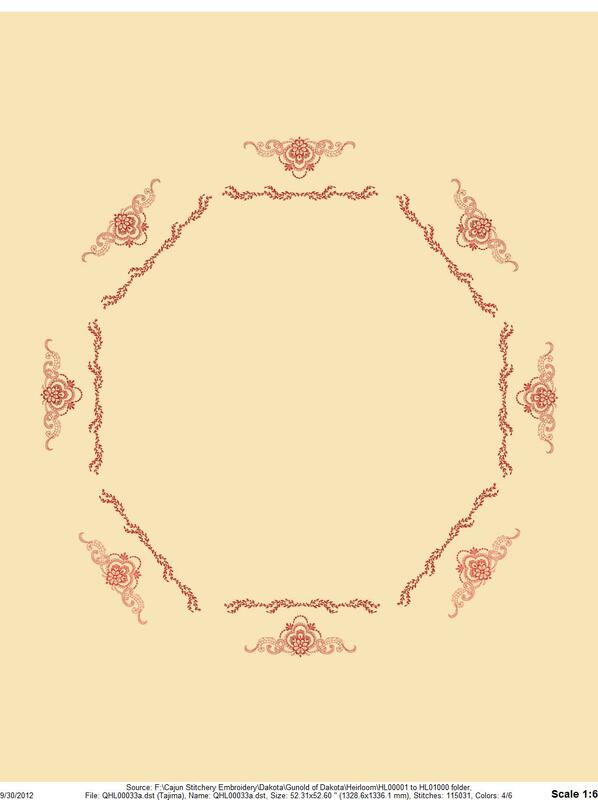 I am able to place the individual stock designs into the program and see how it would look on the tablecloth, more or less. This is an ongoing project. Some of our friends came over and got the sago palms. It worked out really nice since a couple of them came over, brought the food, cooked dinner, and afterward we all enjoyed several glasses of wine and delightful conversation. We’ve been eating and sharing bell peppers from the garden lately. This is truly a bell pepper kind of year. We have one tiny eggplant plant that decided to start producing. Right now we have the beginnings of an eggplant on the plant. We are still watching the tomatoes and hoping for nice big fruit this fall. I was thinking the other day about the internet being world wide. George and I, both, are on Facebook and have acquired many friends that we know only through Facebook. Several of those friends are from other countries. A popular pastime on Facebook is animals and there are lots and lots of posts about how people consider their dogs and cats as family members. We do, too. I wonder what people in other countries who eat dog meat think of our attention to our pets? The oldest known existing embroidery is the Bayeux tapestry; it is believed to have been produced in approximately 1066. It is nearly 70 metres (230 ft) long, and depicts the events leading up to the Norman conquest of England concerning William, Duke of Normandy and Harold, Earl of Wessex, later King of England, and culminating in the Battle of Hastings. It is not actually a tapestry but rather, embroidery. The tapestry is now exhibited at Musée de la Tapisserie de Bayeux in Bayeux, Normandy, France. OMG! I’ve been requested to repeat the huge headboard embroidery design a third time. My week is planned – huge embroidery project. You cannot imagine how tickled I am about this. Last night I was browsing around on YouTube and decided to watch some embroidery videos. The puff embroidery videos said never use more than one layer of the craft foam. Ha! Rules are meant to be broken, right? I always use 2 layers. Then they say never go over the embroidery twice. Pffft! I do when I feel it is necessary but always with the puff embroidery. I don’t want any of those little foam pieces poking out. There is supposed to be a way of passing a hot hair dryer over the foam and it pulls back into the threads, but I’ve never mastered that trick; although, I would love to learn how. I guess my hair dryer isn’t hot enough. This past week we did a lot of digitizing. I’m learning to put a bit more detail in the designs. Who knows? Eventually I may get a hang of this digitizing. We did embroider a couple of market baskets for a friend. One just has the name “Kim” on it and the other has a cat label design with the word Cathy inside. They are cute, cute, and cute. An order came in for two plain, white handkerchiefs with a monogrammed initial in the corner. Both hankies were done. The following day a look at the handkerchiefs revealed a bit of the satin stitch on one of the hankies pulled away from the cloth. Yep, I need to re-do those. A few weeks ago, we went through the studio and bagged up all of our “oops” projects. Things like the hanky where the stitching pulled away from the fabric, some not so perfect designs, hats, patches, etc. Everything went to Waterfront Mission. Do you suppose anyone will want that stuff? I just hate throwing stuff away. George thinks I’m the most frugal human being alive. In order to do good embroidery, you usually need to have stitch outs. 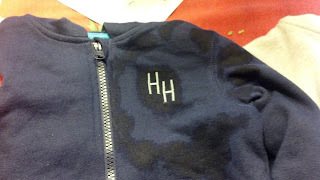 A stitch out is when you are working on a design and need to stitch all or part of a design to see if it stitches well and if it looks as good on fabric as it does on the computer. Some of the stitch outs look great; others, well, not so great. Embroiderers end up with bags of stitch outs. Most embroiderers simply throw out the stitch outs. They are someone else’s design and not worth anything to the embroiderer. The embroiderers don’t want to give the stitch outs to the customer. I don’t have a problem giving the stitch outs to the customer because I have no use for them. Waste not; want not. 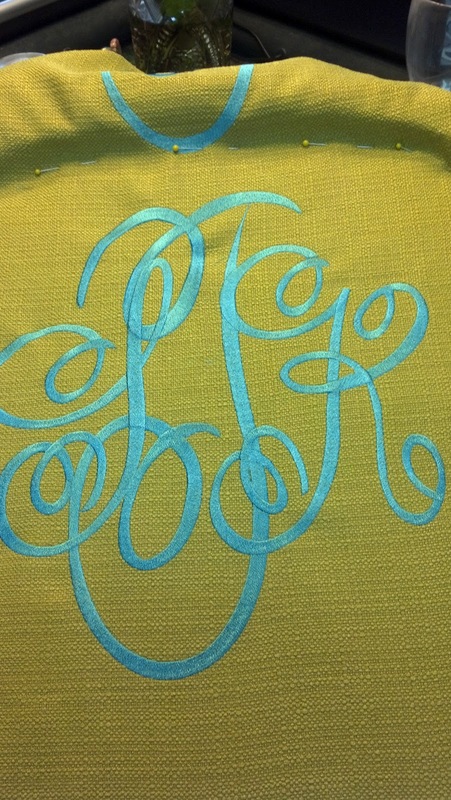 Since I belong to a plethora of embroidery forums and groups online, I have been scolded for this practice. The problem is that the big time embroiderers want money for their efforts. They know that a savvy customer can take their stitch out and profit from it. They have suggested to me that I, at least, charge $1 or something for the stitch outs. Also, they feel that if the smaller embroiderers start giving away the stitch outs, it will lead to their clients expecting the stitch out and the big embroiderers would then lose money. I really don’t know the right answer to the problem. As for Cajun Stitchery, if there are stitch outs that we cannot use, and the customer wants them, we consider it a lagniappe. Good for the customer if they get two for the price of one, or they can make a few dollars extra. We have three baby sago palms in pots that we would be glad to give to anyone who wants them. If you are interested, email me, call me, or just come by and get them. The bell peppers are plentiful this year. Why is it when we plant cayenne peppers we get a huge harvest but cannot seem to get bell peppers to grow? This year we are having a huge harvest of bell peppers but cannot get the cayenne to grow. George loves just cutting up the bell peppers and using a dressing as a dip and voila he has a snack. The tomatoes are starting to bloom. This year we planted four beefsteak tomato plants. One in particular I ordered from an organic farm in Huntsville, Alabama. If this one yields cherry tomatoes, then I guess, all I can say is that we can only grow cherry tomatoes in this yard. We have nothing against cherry tomatoes. We love them and cook with them and eat them raw. It would just be nice to be able to grow a nice big tomato. The yard long beans are growing and have been producing all summer. We didn’t plant as many plants as we did last year, so, we are not getting the yield that we did last year. Most of the beans have just gone to seed on the vine. The beautiful pots of mums that George gave me are still gorgeous. We are thinking about getting some flower seeds for pansies, mums, petunias, and other cold weather type flowers. It is always nice to see color in the winter. That is, if we have a winter. Last year winter was so warm that all of my plants that need a bit of cold in the winter didn’t do very well. The dishwasher finally arrived and George installed it. Man! This little princess is so over washing dishes by hand. Do you know the names of the three wise monkeys? They are: Mizaru (See no evil), Mikazaru (Kikazaru – Hear no evil), and Mazaru (Iwazaru – Speak no evil). The fourth wise monkey is called Shizaru (Do no evil). Barbie was introduced at the New York Toy Fair on 9 March 1959; her real name is Barbie Millicent Roberts and her parents are Ruth and Elliot Handler. Barbie has four sisters: Skipper (1964), Stacie (1992), Kelly (1995) and Krissy (1995). Ken, Barbie’s boyfriend, debuted in 1961. Unfortunately, they split up on Valentine’s Day 2004. A fathom is 6 feet (1,8 metres). Before the year 1000, the word “she” did not exist in the English language. The singular female reference was the word “heo”, which also was the plural of all genders. The word “she” appeared only in the 12th century, about 400 years after English began to take form. “She” probably derived from the Old English feminine “seo”, the Viking word for feminine reference. It has been another busy week. The huge headboard embroidery design is finished. I am very proud of that project. Now I am repeating the same project for the same client. This time the embroidery not only includes multiple hoopings, and puff embroidery, but also some metallic thread. It is the most beautiful project that I have worked on so far. Sorry, I cannot share photos of the project at this time. This project has definitely built up my confidence as a professional embroiderer. Remember earlier that I said that I planned eventually on George handling not only the hats and caps, but the regular day-to-day logo type embroidery. We are at that point now. George is brushing up his skills, learning some new skills, and is back at the embroidery machine, Boudreaux, stitching out those orders. In the meantime, as George says, I am working on the haute couture embroidery. I call it my Tiffany embroidery. Soon I hope to be able to move into larger quarters because we have run out of room in our little studio. Today I was very tired and George insisted that I take the day off. So, what do you do on your day off? My hobby and passion is embroidery. I spent the day on the computer posting photographs of our embroidery on Facebook. It initiated some good conversations and I even got an order. I think the people on Facebook will be happy that I have now stopped posting – at least, for awhile. This year we have bell peppers all over the garden and not one of our chili pepper plants has grown. How funny is that? Especially when you consider that last year we had so many chili peppers that we kept ourselves and a local restaurant stocked. This seems to be the year of the ginger. Not necessarily edible ginger, but ginger plants. We have all kinds of ginger plants – including the edible ones. They are beautiful plants. Some we don’t even know how they got in our garden. The tomato plants are in the garden and they are huge but so far all we have are 2 cherry size tomatoes. I sure hope the beefsteak tomatoes start producing soon. Beans are also doing well in the garden, although nothing like last year. We didn’t plant nearly as many beans this year. George did, intentionally, turn over a bucket of sweet potatoes to see if we have any. He got a handful of little sweet potatoes. I guess we will leave the other bucket alone for now. Anyone know when we are supposed to dig those things up? I think we will be replanting these little sweet potatoes that George harvested. We planted horseradish, again. It is already growing. Can’t wait for the taste of fresh horseradish. 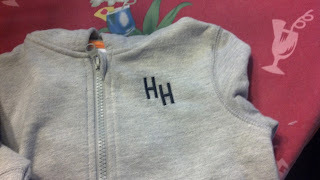 We did monogram a little boy’s jacket this week. Imagine a Blue Angel’s jacket in miniature. It is the most adorable thing. It is for a friend’s grandson. You did good, Gram. Hopefully this week we will get our new dishwasher. This washing dishes by hand is getting old. The Nereids Splash Party was wonderful. Everyone was soaked and everyone had a great time. What current branch of the U.S. military was a corps of only 50 soldiers when World War I broke out? A: The U.S. Air Force. What game was created by French mathematician Blaise Pascal, which he discovered when doing experiments into perpetual motion? A: The Game of Roulette. Who said: "I'm the president of the United States and I'm not going to eat any more broccoli"? What president was shot while walking to California Governor Jerry Brown' office? Who earned infamy for noting: "A billion dollars isn't worth what it used to be"? What ethnic group was largely responsible for building most of the early railways in the U.S. West? Hope everyone had a wonderful Labor Day weekend. Yippee!!! George got Boudreaux to embroider on a structured hat. It really turned out beautiful. This week I’ve been working on a 33” wide by 27” tall embroidery design for a headboard. This is a huge design that requires several hoopings, puff embroidery and metallic thread. The digitizing was all done by me. 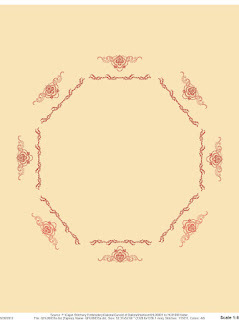 The design was taken from several designs on an antique bed cover. Yes, it is gorgeous. It sure is taking a long time to finalize. The digitizing seemed to take forever. Then I did several stitch outs. The design involved lots of editing. I am finally in the process of stitching out the large design to test for any kinks and fix them before I begin embroidering the final. So far I have stitched out 4 hoopings, stopping to edit as I go along. This has taken 2 days. There are 11 hoopings. Hopefully, this stitch out will be finished soon and I can get to the final. You know I have a low patience threshold and I want this project finished but I do want to do it right. Puff embroidery is embroidery using craft foam and embroidering over the foam to create height and texture in the embroidery. With this project I learned that puff embroidery is not a new thing. Puff embroidery has been around for centuries. Of course, the antique puff embroidery did not use craft foam, but rather a build up of thread. And I thought it was a new idea. Ha! I called Social Security this week for an appointment and was told that I completed the online form very well and that I don’t need to come into their office. The check should arrive in December. Woohoo! Just in time for Christmas!!!! I guess working all those years will finally pay off. Plus, they told me that recipients are no longer limited to earning $800 per month before the earnings start to have an effect on the check. Now recipients can earn $1,200 per month before the earnings begin to impinge on the check. Good news to know. Our dishwasher died this week. That dishwasher was almost 20 years old. George tried to fix it, but it was fatal. That dishwasher is not coming back. So, George called the garbage collector and arranged to have the old dishwasher picked up the following morning. He put the dishwasher on the side of the street, in front of the house. When we awoke in the morning the dishwasher was gone. It is what we call the midnight blue light special. That is the height of recycling. George called the garbage collector to tell them not to come but the girl apparently didn’t get in touch with the truck driver soon enough and there he was looking for the dishwasher. George ordered a new dishwasher that was going to arrive the following day. It turned out that we won’t get the new dishwasher until the 18th or 19th. We are back to old fashioned washing dishes by hand. Yep, there’s a sink full as I type. I miss my dishwasher. I think we may be dining out often until the delivery arrives. This Sunday is the Splash Party. The tee shirts have been received and embroidered. All but 6 have been delivered. The rest of the girls will get their shirts Sunday morning. This party is going to be a real splash. It begins at 1:00 p.m. at Paradise Bar and Grill on Pensacola Beach. Boogie, Inc. will be our DJ. We will have a dunking booth and lots and lots of raffles, including several big water guns. Additional water guns will be on sale for those who forget to bring them, but the guns are limited so try to remember to bring your own. Plus, we are going to have a 50/50 drawing. At 3:00 p.m. there will be a live band, Victor Wainright. Everyone is welcome, so please join us this Sunday. Be prepared to get soaked. I’ve already embellished my shirt. George went water gun shopping and returned with two guns. One shoots water 27 feet and the other shoots water 40 feet. Yes, George has been outside trying the guns out. No one in this neighborhood is safe from George and his water guns. And that means those neighbors who are reading this and walk in front of the house frequently. Beware of the man with the water gun. The girls love to tease me about Facebook. Well, this week is a banner week. I now have 4,000 friends on Facebook. The Code of Hammurabi is the earliest known example of a ruler publicly proclaiming to his people an entire set of laws, in an orderly arrangement, so that all of men might read and known what was required of them. Hammurabi was a ruler of ancient Babylon, probably from around 1795 B.C. to about 1750 B.C. His code was carved on a black stone monument, in 3,600 lines of cuneiform, standing eight feet high, and obviously intended for public view. This monument was discovered in 1901, not in Babylon, but in the Persian mountains, where it had probably been carried by some triumphant conqueror. It begins and ends with addresses to the gods and curses for anyone who neglects or destroys the law. It then goes on to list an organized code of laws and regulations for society. For example, a judge who makes a mistake in a case of law is to be expelled from his judgeship forever and issued a heavy fine. Any witness who gives false testimony is to be executed. All of the more serious crimes, in fact, are punishable by death -- even unintentional crimes. For instance, if a man builds a house badly, and it collapses and kills its owner, the builder is to be executed. If the owner's son was killed, then the builder's son is to be killed. Many believe the Code of Hammurabi or some similar code of laws to be the source of the Hebrew's edict of "an eye for an eye". The only escape for an accused person was to throw himself into "the river," the Euphrates. If the current carried him to shore alive, he was declared innocent. If he drowned, he was guilty. Although there were definitely earlier codes of law (their existence is even implied in Hammurabi's code), they have all disappeared -- leaving the Code of Hammurabi as the earliest surviving system of laws. George has been working with Boudreaux lately. Now that we have Clothilde, I rarely work with Boudreaux, unless I need to use some of Boudreaux’s hoops. Boudreaux has a greater variety of hoops than Clothilde. As time goes by, and money comes in, we’ll get more hoops for Clothilde but for now Clothilde has the biggest hoops and Boudreaux has the largest variety of hoops. Nevertheless, George had stopped embroidering when he went next door to remodel the house. He’s back in the saddle, again. He is definitely my hat guy but can do it all on the embroidery machine. It turns out that Clothilde embroiders on structured hats better than Boudreaux. When we first began embroidery on hats and caps, we simply couldn’t get Boudreaux to stitch on structured hats. We read periodicals saying that different machines embroider better on various types of head wear. That must be true because Clothilde does fine with structured hats. The problem is that Clothilde has to stop all of her beautiful “couture” embroidery to do the hats. Some day we will replace Boudreaux with an Amaya but that is way down the road. A local pastor contacted us requesting embroidery on his robe. The digitizing was done and he brought the robe over for embroidery right before Hurricane Isaac. As he was leaving, he asked if we were prepared for the storm. I told him that I prayed the then tropical storm would go someplace else and not hit Pensacola. We were prepared but I believe in prayer and TS Isaac just had to go elsewhere. As it turned out, Hurricane Isaac did go elsewhere and we only got some tropical storm winds and rain. When the pastor returned to pick up his embroidered robe I asked the topic of his sermon this week. He said, “Forgiveness.” I told him I was surprised it wasn’t on the power of prayer. Speaking of Isaac, I was very happy that my friends and family in New Orleans and SW Louisiana were not hurt by the storm. The ones I’ve been in touch with told me that they never lost electricity but did gain a houseful of guests who had lost electricity and utilities. As I said, we just got wind gusts and some rain. The wind did clean out the trees. Sammy, the 70 pound, 8 month old puppy, must have thought it was Christmas. He is a retriever, after all. As the branches would fall from the trees, he was running around retrieving all of the limbs. George said it would have been nice if he had then stacked them all together, but such was not the case. Sam has played with tree branches all week, just running around with branches in his mouth. He is a bit perplexed about a large palm frond that fell. He tried carrying it around but it was just too big. This November I turn 62 years old. I have debated all year whether or not to apply for early Social Security. Cajun Stitchery is three and a half years old and doing well for three and a half years. After vexing over this, I decided to go ahead and apply. I did the entire thing online. Now I have to make an appointment with our local Social Security people and bring them my certified birth certificate, and then it is done. Wow! It is just amazing to think that I have reached this age. Does this mean that I am now old and wise? Next Sunday the Mystic Krewe of Nereids will be hosting our annual Splash Party at Paradise Bar & Grill on Pensacola Beach. The event begins at 1:00 p.m. We will have a dunking booth, lots of water guns, 50/50 raffle, and raffles for water guns and coolers and a whole lot of music and fun. Please join us and bring a friend. I think our charity this year is breast cancer. Cajun Stitchery has embroidered krewe tee shits for the Splash Party. Just look for the girls in the California Blue tee shirts. That will be us. It is illegal for a doctor to ask a patient whether they own a gun. The state constitution allows for freedom of speech, a trial by jury, and pregnant pigs to not be confined in cages. One may not commit any “unnatural acts” with another person. Doors of all public buildings must open outward. It is illegal to sell your children. You may not fart in a public place after 6 P.